A few hours before the start of the 2013 Conclave, Cardinal Dean Angelo Sodano, who is part of the extended circle of favorites for the office of the Pope, called for the “unity of the Church”. 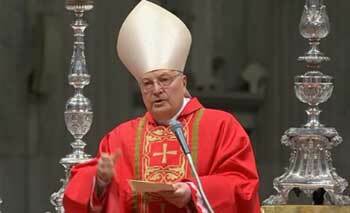 He also called for a closed support for a new pontiff. “Each of us is therefore called to cooperate with the Successor of Peter (the pope), the visible foundation of such an ecclesial unity”, said the Cardinal. Sodano also praised the term of office of the retired Pope Benedict XVI., as a “brilliant pontificate” and thanked him accompanied by long lasting applause of those present. “The basic attitude of every shepherd is to lay down one’s life for his sheep (John 10:15),” Sodano said. This entry was posted in Conclave 2013 and tagged Admonitory words, Angelo Sodano, brilliant pontificate, Cardinal Dean, church, conclave, Congregation for the Doctrine of the Faith, ecclesial unity, german, Holy Church, Holy Spirit, Missa pro eligendo Romano Pontefice, ratzinger, sheep, shepherd, Sistine Chapel, St. Peter's Basilica, successor, unity of the Church by auditor. Bookmark the permalink.